Biostar is pleased to announce the second generation RACING series features for its motherboards that will support the new 7th-generation Intel Core processors. 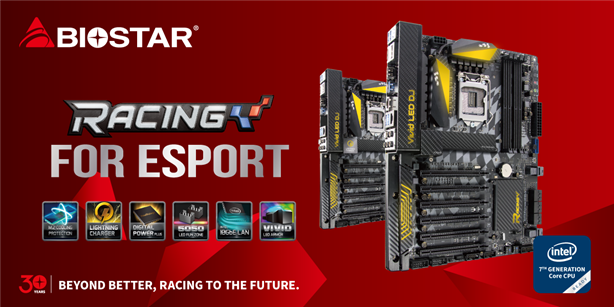 The Biostar RACING series is geared towards gamers and enthusiasts and Biostar wants to ensure they offer the latest and the best features available with their motherboards. The new features will ensure top-of-the-line quality, best gaming experience and better aesthetics for the RACING series motherboards. The new set of features aim to further enhance performance and style of the RACING series. Some of the new features for the second generation RACING series include the new M.2 Cooling Protection, 10GbE LAN, Lightning Charger and the improved ones for LED lighting. Combined, all the new features will provide a different level of experience for enthusiasts and gamers. Let’s check out the new features below. Intel’s X550 chipset supports 10GbE LAN, delivering 10 times faster data transfer speed and bandwidth than traditional GbE LAN as well as bringing with it lower power consumption. Together with the latest Intel 7th-generation processors, this will be the fastest motherboards for online game. The new 2nd-generation BIOSTAR RACING motherboards will be the first to have the new Lightning Charger which helps the battery of enabled devices, including smartphones or tablets, to achieve up to 75% charge in just 30 minutes. It supports QC2.0 (12V/1.5A output), Apple Mode (5V /2.4A) and BC1.2. Digital Power+ uses IR’s digital power controller to bring your PC and processor exceptionally high-performance and ultra-stable operation. This unique technology uses PCI Express 3.0 x4 for a maximum of 32Gb/s of bandwidth resulting in transfer rates as fast as 6.5x more than traditional SATA solid-state drives.